The Edwardians appear to have had a bit of a penchant for pigs if several of the books in the Tower collection are anything to go by. Amongst the many curiosities we come across in the Tower Project, the most recently observed is a trend for guest or visitor books in which instead of writing that you had enjoyed your stay / had a lovely time etc., you were encouraged by your hosts to draw a pig, whilst blindfolded. When visits, dinners, luncheons end, this book is brought to every friend. One is not asked fine prose to write, or yet a poem to indite; one only needs his eyes to close, and draw a pig, from tail to nose. This outline now fill in with ink, leave pig an eye, his tail a kink. 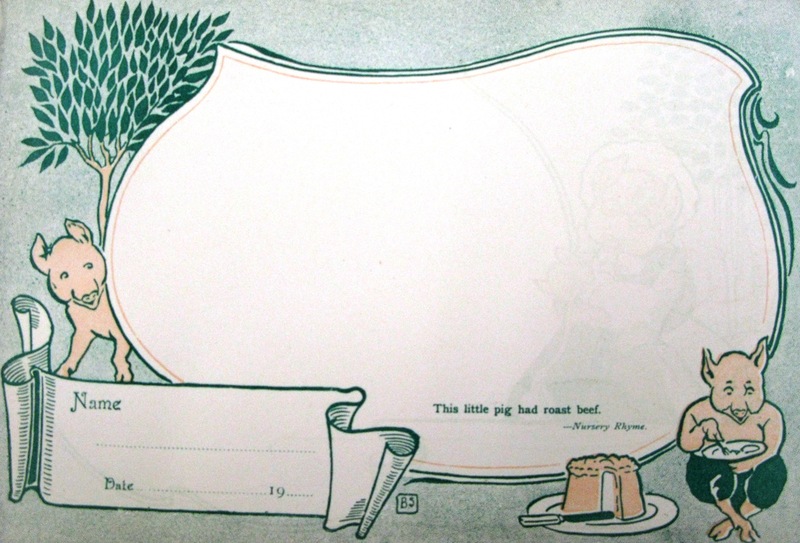 The idea is that the artist must hold a newspaper in front of their face, or be blindfolded, and draw a pig without lifting the pencil from the page (except to add the pig’s eye). The artist then signs and dates their drawing as a record of their visit. 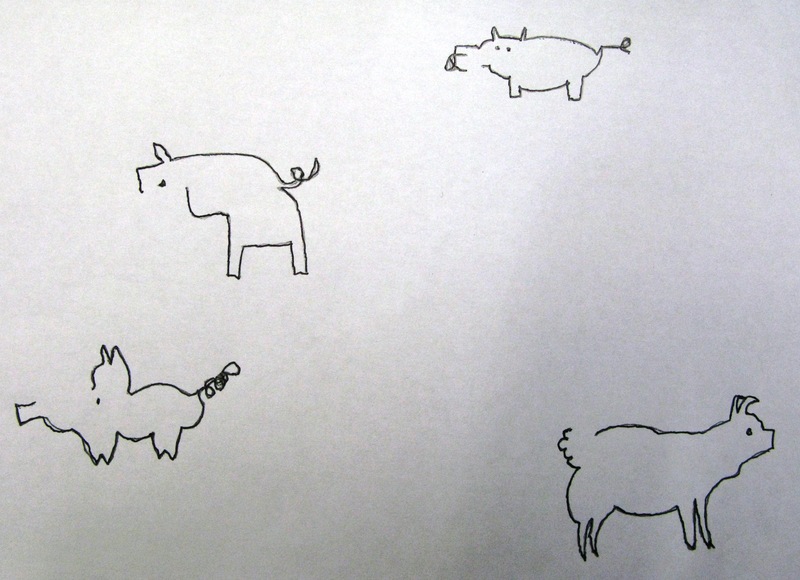 A typical page from 'Pig book'. Each page has decorative borders of anthropomorphic pigs accompanied by a quotation about pigs. These books are an entertaining change from the usual guest books I have seen and I imagine they provided plenty of amusement for both host and guest alike, perhaps even more so at dinner-parties if the guests drew a pig when they were a little worse for wear! 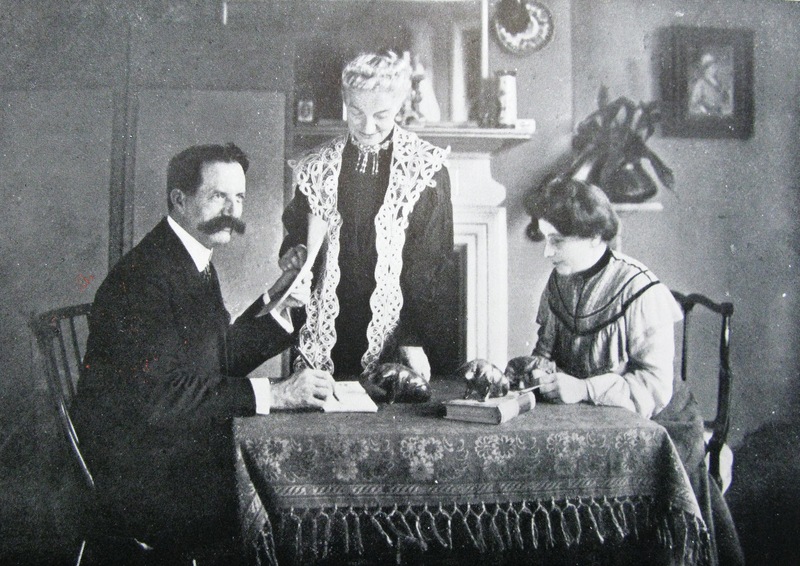 The people in this photograph even have pig figurines on the table to inspire their drawing, so this amusement clearly became quite competitive!